The eight stories in this collection contain multitudes. Chai interrogates heavy subjects with a light touch. She grants each character with the gift of a gleaming voice, rendering them to be shaped by circumstances, while also transcending them. 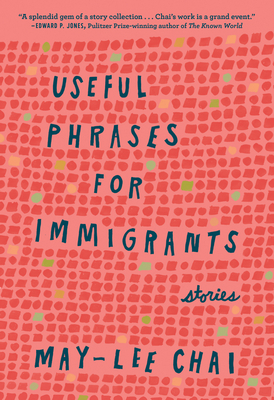 Useful Phrases for Immigrants is more than merely “useful,” this is essential reading and I'm honored to choose this book for the Bakwin Award.--Tayari Jones, author of An American Marriage, Silver Sparrow, The Untelling, and Leaving Atlanta, judge of the 2017 Bakwin Award for Writing by a Woman. "May-lee Chai presents us with a splendid gem of a story collection . . . Complementing the vivid characters, the reader has the gift of language―'a wind so treacherous it had its own name,' 'summer days stretched taffy slow'....Chai's work is a grand event." –Edward P. Jones, Pulitzer Prize-winning author of The Known World, All Aunt Hagar's Children, and Lost in the City. In the title story of this timely and innovative collection, a young woman wearing a Prada coat attempts to redeem a coupon for plastic storage bins while her in-laws are at home watching the Chinese news and taking her private phone calls. It is the lively and wise juxtaposition of cultures, generations, and emotions that characterize May-lee Chai’s amazing stories. Within them, readers will find a complex blend of cultures spanning China, the Chinese diaspora in America, and finally, the world at large. With luminous prose and sharp-eyed observations, Chai reveals her characters’ hopes and fears, and our own: a grieving historian seeking solace from an old lover in Beijing, a young girl discovering her immigrant mother's infidelity, workers constructing a shopping mall in central China who make a shocking discovery. Families struggle with long-held grudges, reinvent traditions, and make mysterious visits to shadowy strangers from their past―all rendered with economy and beauty.